Most councilors lauded the plan as an important step in addressing climate change. Councilor Terry Clark said it could also lower energy costs and spur economic development. “Because we’ll be looking at new technologies and tearing down the old system or rebuilding the old system, that it’s going to create a huge number of jobs and interest in this region,” Clark said. Councilor Robert Sutherland was the lone “no” vote. He said he felt the city was already doing enough on the issue. Keene has been working on climate change adaptation for nearly 20 years, and has cut its municipal carbon emissions by 25 percent. The city will write a strategic plan for achieving the goals, with public input, by the end of 2020. Concord, Portsmouth, Plainfield, Cornish and Hanover are pursuing similar plans. Even if countries cut greenhouse gas emissions immediately, New Hampshire will get warmer and wetter within the next three decades, and towns need to plan accordingly. That was the topic of Nashua's first Resilient Nashua Summit, which the city hosted Tuesday as part of a year-long initative to gather input on its plan for dealing with natural disasters exacerbated by climate change. Business support for offshore wind is building in New Hampshire. Governor Chris Sununu said Monday he'd requested a federal task force that would be a first step to development. Concord is the latest city to set a goal of working toward using all renewable energy sources in the coming decades. Concord's city council unanimously passed a non-binding resolution on the issue Monday night. The new goal includes public works, homes and businesses, and covers heat and transportation, as well as electricity. Over the next year, the city will seek public input and write a strategic plan on how it could achieve the goals. 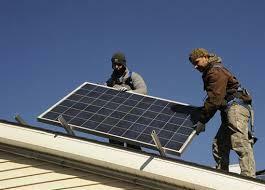 A new report from the Sierra Club says about 50 American municipalities are now working on using 100 percent renewable energy in the coming years. The first New Hampshire town to get on board was Hanover, which says it’s nearly a quarter of the way toward using only renewable electricity by 2030.